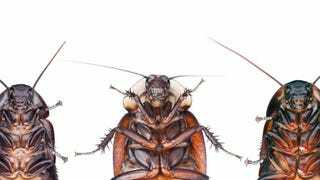 Controlling cockroaches with electrical 'backpacks' is one of those science experiments that's simultaneously quite cool and ethically grey. What might make you feel better, though, is the knowledge that those remote-controlled cockroaches may save your life if you ever get trapped inside a burning building. Researchers from North Carolina State University have outfitted cyborg cockroaches with microphones which, when wired up to the roaches' normal sensory appartus, means that the 'biobots' will seek out the source of a sound. The scientists hope that, in addition to providing a good tracking tool to Skynet, this will also enable humans to find other humans in enclosed spaces like a collapsed building. Cyborg cockroaches themselves are nothing particularly new — 'Roboroach' kits let you cheaply control your very own cockroach, by microstimulating the cockraoches' antennae with eletrical signals — like steering a horse with reins, only these reins are electrodes that are strapped to their heads. The North Carolina researchers took this one step further, attaching microphones to their roaches' cerci, which are the sensory organs that cockroaches normally use to sense if their abdomen brushes into something. Therefore, by stimulating the cerci, the roach can be 'encouraged' to move forward, or left, or right, and ultimately towards the source of a sound. The hope is that those sounds will end up being people screaming for help, and that by trapping the cockroaches' transmitters, rescuers will be able to find people trapped in disaster scenarios.